Dana Richardson & Sarah Zentz, of Dana & Sarah Films, won a prestigious Gold Award for Women Filmmakers from the Prestige Film Award. Dana Richardson & Sarah Zentz, of Dana & Sarah Films, won a prestigious Gold Award for Documentary Feature from the International Independent Film Awards. Dana Richardson & Sarah Zentz, of Dana & Sarah Films, won a prestigious Award of Merit for Women Filmmakers from the Accolade Global Film Competition. 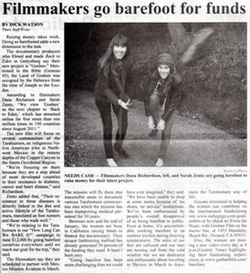 Dana Richardson & Sarah Zentz, of Dana & Sarah Films, won a prestigious Award of Merit from the IndieFEST Film Awards. The award was given for Dana & Sarah Film's powerful documentary, GOSHEN, which digs deep into the culture of the Tarahumara. GOSHEN features an exceptional cast including Christopher McDougall, author of Born to Run, and an exceptional soundtrack featuring music from amiina and Romayne Wheeler. Goshen is an official selection of the Green Unplugged Film Festival (2015). Goshen premiered at the San Luis Obispo International Film Festival (2015)! They’re anxious to share what they learned about these amazing people who are free from heart disease, type II diabetes, and cancer. GOSHEN unveils the mystery of how to establish healthy, sustainable communities that can survive, even thrive, despite the global increases in famine and diseases. LISTEN to the show in the player (left)! GOSHEN is a captivating documentary, following the remarkable story of the indigenous Tarahumara tribe. Renowned for their incredible long distance running, the Tarahumara have fought tirelessly to protect their indigenous culture, and in doing so have also managed to stave-off the top three diseases of our time – type 2 diabetes, cancer and heart disease. On February 1, Dana & Sarah Films kicked off their 40-day Indiegogo crowd funder to complete production of GOSHEN, a documentary revealing the untold story of the Tarahumara ultra-runner tribe and their super food diet. GOSHEN receives Stomp of Approval from Barefoot Runners Society! Raising money takes work. Doing so barefoot adds a new dimension to the task. The documentary producers who filmed and made Back to Eden in Gettysburg say their new project is "Goshen." Mentioned in the Bible (Genesis 45), the Land of Goshen was occupied by the Hebrews from the time of Joseph to the Exodus. According to filmmakers Dana Richardson and Sarah Zentz, "We view 'Goshen' as the next chapter to 'Back to Eden,' which has streamed online for free more than one million times in 150 countries since August 2011." The new film will focus on several communities of the Tarahumara, an indigenous Native American tribe in Northwest Mexico in the remote depths of the Copper Canyon in the Sierra Occidental Region. "We're focusing on them because they are a step ahead of most developed countries in their resistance to diabetes, cancer and heart disease," said Richardson. Zentz added that, "Their resistance to these diseases is directly linked to the diet and active lifestyle of the Tarahumara (translated as foot runners and those who walk well...)." Back To Eden Film takes 3RD PLACE as the second runner-up to the most viewed film in the Green Unplugged Online Film Festival. We reached 33,000 VIEWERS of our film through this festival! 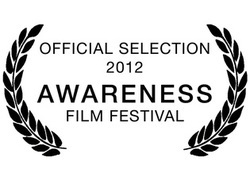 Back to Eden Film was an official selection of the 2012 Awareness Festival! The screening took place at the Healthy Living Center in Los Angeles, CA on Sunday, May 6th. The mission of the Awareness Film & Arts Festival is to bring awareness and to open eyes to some of our world’s pressing issues. The category we were selected to feature in was the “Green!” category. Back to Eden Film is a documentary that focuses on simple, sustainable, solutions to environmental and ecological issues facing conventional agriculture. Food is central to all life and is manifest in diverse realms of human experience including religion, politics, economics, gender, science, health and art. This exhibition The Ecology of Food: Past, Present and Future explores artists responses to the ways our food supply has been impacted by natural changes, genetic engineering, global warming and human action. 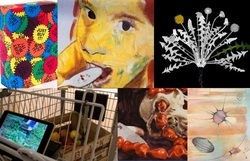 The exhibit consists of a variety of media including photography, painting, video and installation that reference food issues and it’s spiritual, emotional and political implications. At the opening reception of the exhibition on Wednesday, October 3, 5-7 p.m., Tom Rivers, Batavia-based author of the acclaimed book “Farm Hands: Hard work and lessons from Western New York Fields” will present a talk titled "From field to fork, a journalist reports on six months in the fields with farmworkers." His book is based on a series of articles Rivers wrote for Batavia’s The Daily News, illuminates the labor shortage on New York farms. “Farm Hands” details Rivers’ first-hand experience with farm work when he took 13 different farm labor jobs during the summer of 2008 with no previous experience. Tom Rivers has been awarded The Golden Pitchfork Prize by farmers of the New York State Agricultural Society and according to The Buffalo News, “Farm Hands” was read nationally by politicians, including members of the American Farm Bureau. As a big fan of wood chip mulch, I watched with great interest the popular documentary film Back to Eden, the first-ever feature-length movie on mulch. 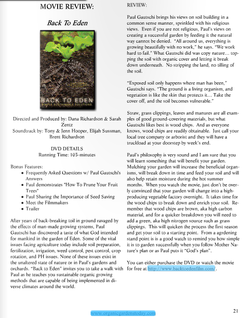 The Back to Eden film profiles the wood-chip-mulched garden of Paul Gautschi, a devout Christian who grows vegetables and fruits on Washington’s Olympic Peninsula. The film’s producer, evangelist Michael Barrett, wisely enlisted the help of Dana Richardson and Sarah Zentz of ProVisions Productions to make the film, which can be viewed free at backtoedenfilm.com. The result is an interesting 103-minute film that balances Gautschi’s religious interpretation of wood chip mulch with comments by soil experts, organic farmers, and the stable owner where Gautschi gets his horse manure. nature has all the answers. He realized that the forest ﬂoor with its layers of duff or mulch provided the most wonderfully rich soil that was continually being added to. He replicated that to some extent in his vegetable garden and orchard. Paul advocates no digging, and using cover (mulch) of various kinds; fairly ﬁne wood chips (and compost) being his preference. He and several others expound on the beneﬁts of this in terms of water-holding capacity, soil structure, mineral uptake, higher nutritional quality and no problems with weeds, pests and diseases. Surprisingly he reports that plants supposedly requiring different pH levels all do well with the same mulch. Streaming online for free 24/7, the film is a gardening resource that teaches how to eliminate all of the work associated with growing food! 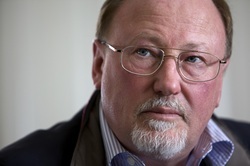 Following in the footsteps of Ruth Stout (No Work Garden Book) and Masanobu Fukuoka (One Straw Revolution), Paul Gautschi is leading a new revolutionary movement in the organic gardening community. 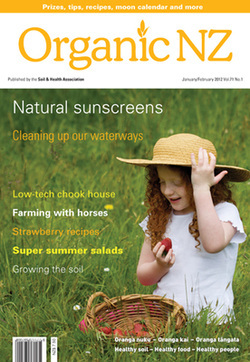 Endorsed by the National Gardening Association, Organic Consumers Association and featured in magazines such as Mother Earth News and Organic Gardening NZ, the film is continuing to impact the way food is grown around the world. It’s all about the cover. In a nutshell — or more accurately, a woodchip — that’s what Paul Gautschi says is the secret to gardening. Mimic nature by covering the soil with leaves, woodchips and similar organic materials, and gardens all but care for themselves, says this Washington state gardener who shows us how in a new gardening documentary with a central Pennsylvania connection. In their documentary film “Back to Eden,” Sarah Zentz and Dana Richardson tell the story of one man, one acre — and abundance. Maybe you’ve already noticed that much of the fruit from the produce section of the local grocery store that is eaten today doesn’t taste as sweet and is not as juicy, or that the greens are not as full and lush as they once were. In the documentary film “Back to Eden,” independent filmmakers Dana Richardson and Sarah Zentz tells the story of Paul Gautschi who shares his revelation for maintaining a vibrant garden of fruits and vegetables through very simple methods. As a team of collaborators we do not stop often enough to appreciate how Radical Jewelry Makeover has evolved since it was piloted in Richmond, VA in the winter of 2007, but this blog entry is a celebration! Yesterday (9/12/09), several people who have been significant contributors to RJM's momentum converged at theMuseum of Arts and Design in New York City for the museum's "Jewelry Study Day". RJM and Ethical Metalsmiths were represented in two ways. The first event was the second public screening of the new video, "Radical Jewelry Makeover: a traveling community mining and recycling project" and the second event, attended by over 75 people, was a panel discussion featuring Ethical Metalsmiths' Co-director, Susan Kingsley. As Co-director of Ethical Metalsmiths and RJM, I was thrilled to have the opportunity to bring the film makers Sarah Zentz and Dana Richardson as well as three-time RJM participant, Meg Roberts to NYC! Susie Ganch couldn't join us in in NYC, but she was with us in spirit! Everyone that participated in the "Jewelry Study Day" had the opportunity to watch the new 12 minute RJM video. We took several orders for the film, many of which were made by educators in the jewelry and metalsmithing field who are already using Ethical Metalsmiths' materials in their classrooms / studios. the work of Ethical Metalsmiths, co-founded by Christina Miller, Asst Professor at Millersville University. For the non-profit organization Ethical Metalsmiths (EM), video artists Dana Richardson and Sarah Zentz followed the fourth edition of EM’s Radical Jewelry Makeover project during the two-week workshop at Penland School of Crafts, NC. They produced this 12-minute film to showcase the project, which was piloted in 2007 at Virginia Commonwealth University. It features interviews with artists, donors and jewelry from the Penland Makeover as well as others.